This four mile segment of the Royal River Water Trail features New Gloucester’s Intervale Preserve. The Intervale provides some of our watershed’s most valuable habitat for migratory birds, waterfowl, and game birds. This section of the water trail begins at the boat launch at the RRCT Intervale Preserve at Intervale Road (Route 231) and ends at the boat launch at RRCT’s Intervale Preserve at Penney Road. Upriver round-trip paddling is available or preferred from both locations. Both preserves have good parking, though hand-carry boat access at both ends involves steep muddy banks. This is a good segment for fishing, hunting, and birding in addition to paddling. Even at higher water levels this segment still enjoys slow currents, so paddlers are able to venture upstream from either boat launch, navigating beaver dams from Intervale Road. Headed downstream from Intervale Road, the four-mile stretch to Penney Road is narrow and winding, and can be challenging. There are many obstacles in the first few miles including shallow logs that can be floated over in all but the lowest water, and piles of jackstraw that require more careful navigation. At low water this stretch of river is a 20- to 50-ft wide canyon with steep muddy banks. It runs between fields and woodland, but minutes after launching from Intervale Road, all signs of civilization are gone with mature forests on river right. The river has a firm, sandy bottom with splashable shallows as well as deep pools. Large hardwood trees overhang the stream and create a shady tunnel. Roughly one mile of the shoreline on this trip is conserved by the Royal River Conservation Trust, with open public access from that shoreline. Transmission lines signal your arrival at Penney Road. Immediately downstream of the takeout at Penney Road (under the road crossing) there is a steep 30 foot rapid ending in a pool. SPRING 2019 UPDATE: In the Spring of 2019 we paddled this stretch from Intervale Road to Penney Road, with robust numbers of hawks, otter, beaver, ducks, and geese. At moderate spring water levels (no recent rain, but spring run-off with the water levels a few feet below the banks), we needed to exit the canoe twice to get around or over trees. A half-dozen times we needed to lay on the bottom of the canoe to get under large trees. Another half-dozen times we slid or shimmied over trees without leaving the boat. With a few inches’ change in water levels either up or down, we would have needed to exit the boat more often, perhaps significantly more often. SPRING 2019 UPRIVER FROM PENNEY ROAD: In the Spring of 2019 there were only three large trees across the river from Penney Road headed upriver to RRCT’s mid-river ownership (see map). Each of these three trees can likely easily be navigated under, over, or portaged around during any water level. The shoreline for this trip from Penney to RRCT’s ownership and back includes one oxbow island, a beaver house, visits with otters, and more. The shoreline on this stretch does not include mature forests until reaching RRCT’s ownership, and is dominated by alder, scrub, and honeysuckle. Boat access with good parking is available at RRCT’s Intervale Preserve on Intervale Road (Route 231) in New Gloucester. Steep muddy banks and a narrow river with obstacles make this access suitable only for some paddlers. Information on trails, parking, directions, and more for this parcel is HERE. There is public boat access at this Parcel on the upriver easterly corner of the Penney Road bridge. Parking is available on the road shoulder, or with clearance on the unimproved gravel road. This access point will be disrupted in 2020 or later due to CMP powerline improvements, and will be upgraded following that work. Information on trails, parking, directions, and more for this parcel is HERE. Looking for an adventure out of the boat? Here is more information on the land preserves & trails you can explore on foot along this segment. 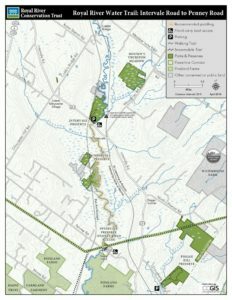 Intervale Preserve – There are three segmented, discontinous parcels that make up the Intervale Preserve and this segment of the Royal River allows access to all three. Pisgah Hill Preserve – Just a short drive from the Intervale Preserve at Penney Road, Pisgah Hill Preserve visitors can enjoy a one mile loop trail with scenic views from the Pisgah Hill summit and ridgeline, small old quarries, mixed forests, and beautiful ground cover of lichen and mosses. All rivers require attention to safety. Paddling conditions vary according to weather and season, so always exercise caution and always wear a life jacket. With good judgement and proper equipment, risks can be reduced. Respect the natural world and the rights of landowners along the river, and be considerate of other outdoor enthusiasts. Please avoid causing erosion, trampling vegetation, disturbing wildlife, or harming water quality. Always respect private landowners and “posted” (no trespassing) signs. Please remember that it is always illegal and dangerous to walk on any rail line or rail trestle.